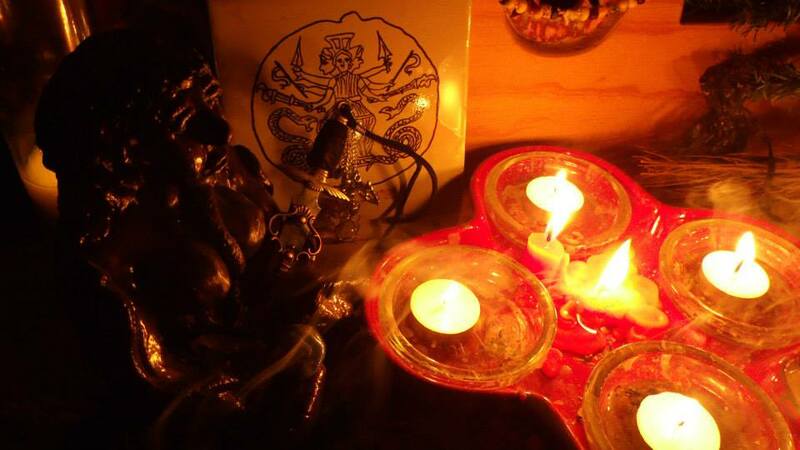 Altars are way better than the books make them out to be. Recently on the garbled, unintelligible mess that was the most recent episode of Inciting A Brewhaha, we asked for you all to send in your altar pics! 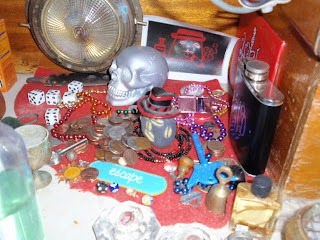 It's always fun to see people's altars. Gives you a peek into their lives, their likes, their gods, and their taste. It's also a fun way to get ideas for your own witchy space. Below are a few altars sent in by YOU! If you'd like your altar featured, please email me your witchy set up to FireLyte@incitingariot.com! PS. We'd like to sincerely apologize for the audio quality in the last show. We have no idea what happened, and we aren't able to fix it. Please forgive us, as we will get you another episode soon! Plus, don't forget our LIVE show this year at Chicago Pagan Pride! Be there by 2pm to be a part of the live recording! 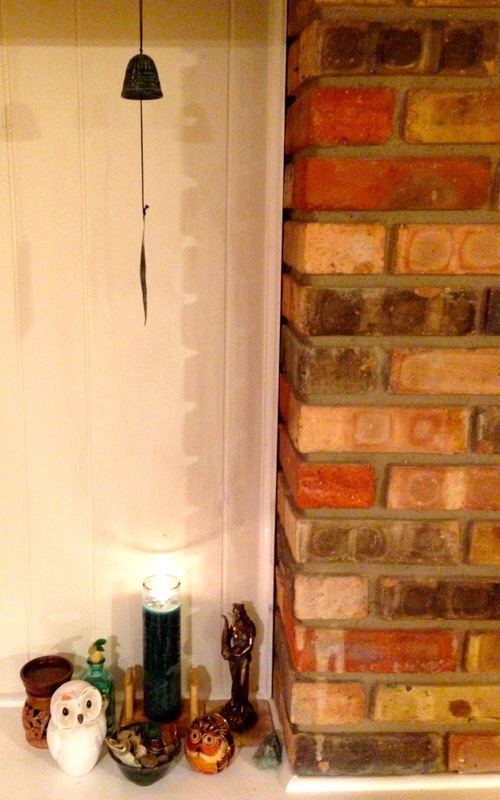 Ally says this is the altar in her university flat. An educated witch! Gotta love that! 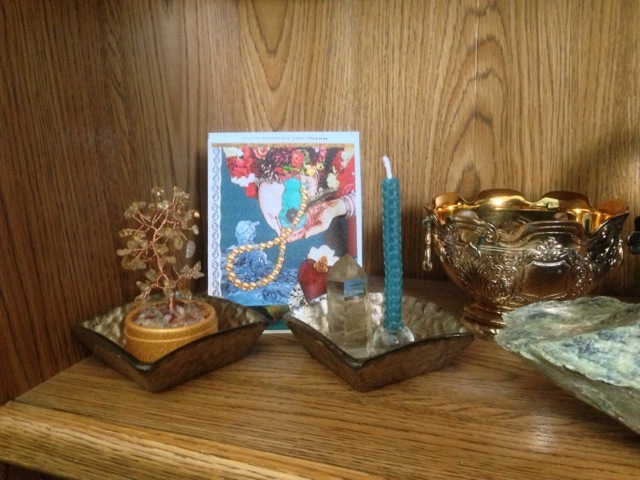 Nicole's altar is simple and features some beautiful statuary. Perfect for the busy witch on the go! 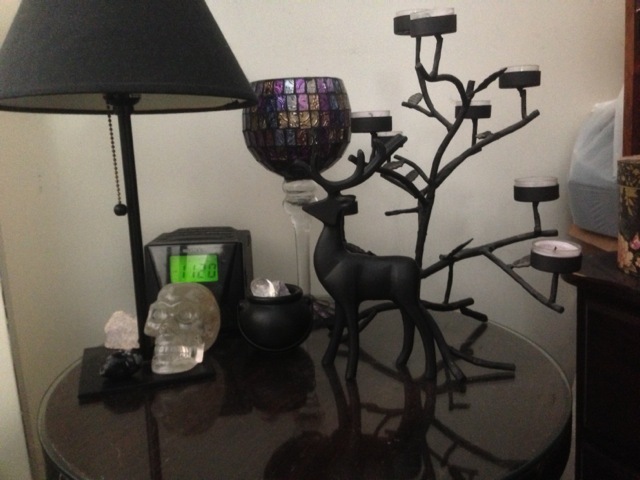 Stephanie's witchy room is in an entirely different league. 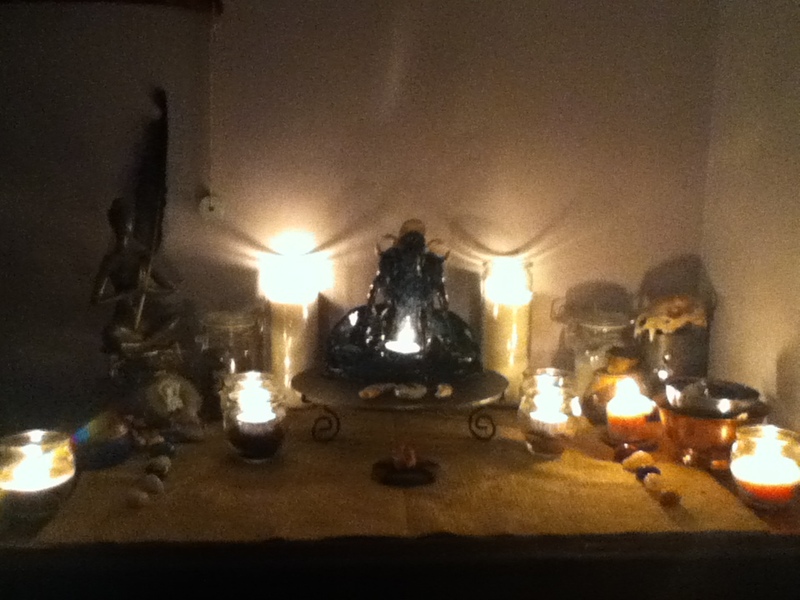 It's serene, well-kept, and is what my altar room wants to be when it grows up. I have a few altars. 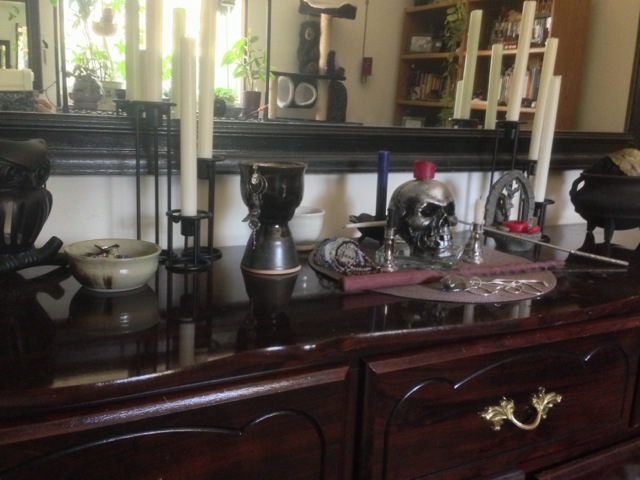 My altar room doubles as my painting space, writing and reading room, and houses our big fancy Apple desktop. It's where the Riot gets incited, and it's most recently become my favorite room in the house with the addition of a squishy futon. But, that's actually not my most active altar. My most active altar is the Fortuna altar that resides in the living room. However, I realized - without meaning to or having any intention - that some other goddess imagery has made its way to the Fortuna altar. Nobody seems to be having any fights or issues, and, like I said, I didn't do it intentionally. So, maybe they forgive me. Or, maybe they're getting along just fine and enjoy the girl talk in my living room. I have a thing for masks. Want to make me happy? Give me a mask. The plastic bins hold my art show supplies. It's not pretty, but it works. Also, I have a lot of books. I actually moved books out of the way to make this picture cleaner. Oh, and I blurred out my college degree because you people are crazy stalkers. That or I may have wanted to play with that retouch function in iPhoto. 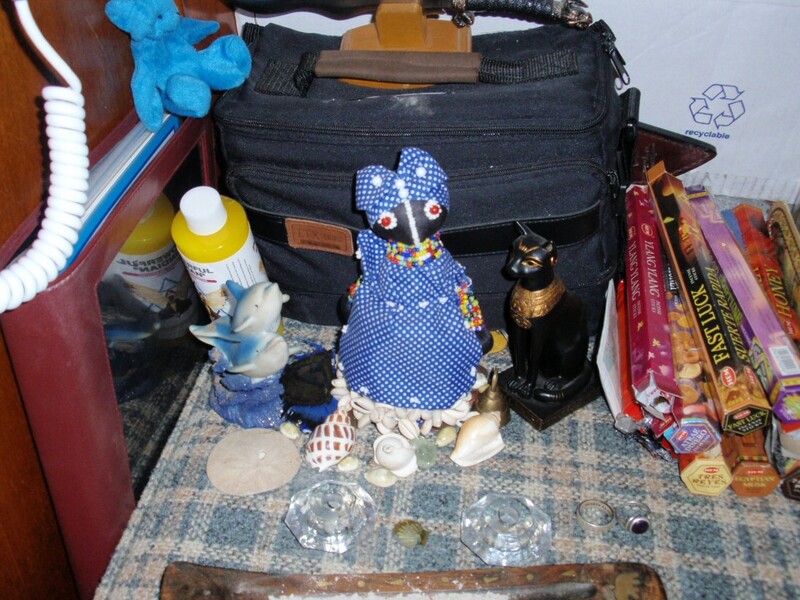 My altar is well-traveled! 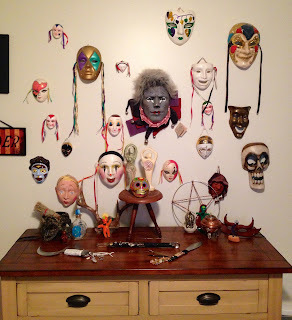 I have pieces here from Mexico - the leather mask on the wall and the clay skull - masks from various countries, dolls from Mrs. Oddly, besom, bottle, and athame from Eliora, wand from a shop owner in Texas. I painted both of the statues. They were each white originally. The goddess just needed to be a tree. 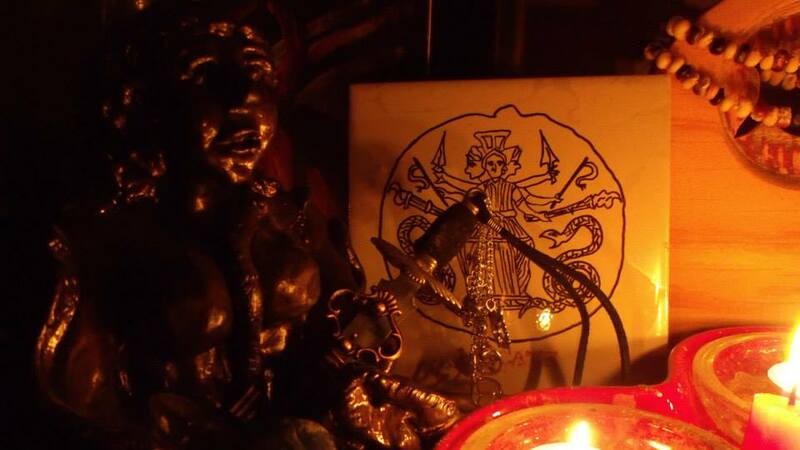 My Fortuna altar has taken on a life of its own. The bell was a gift from Velma. It sings the most beautiful tune. Oil from Mrs. Oddly. Fortuna statue I got from a friend. Jade bowl (REAL JADE!!!) also a gift from Velma. Money from the depths of my pockets. Owls from Velma and ... um... don't remember where the white one came from. I think Ross. Wisdom, guidance, fortune, fate, and prosperity watching over me daily, guiding my little Riotous house that could. My glamorous computer altar. 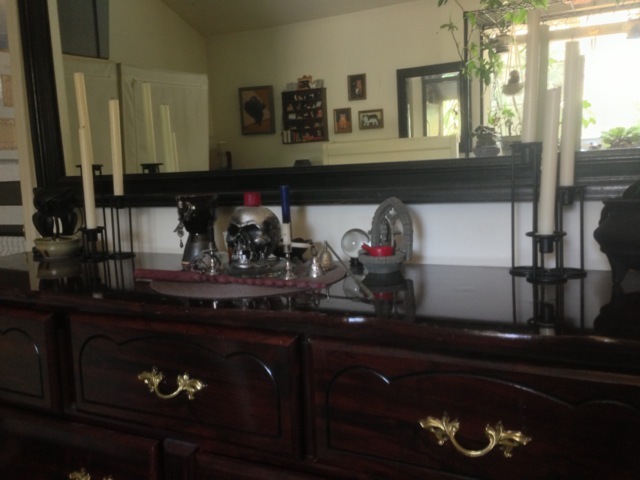 LOL... Not an altar, but hey! It's the blog! 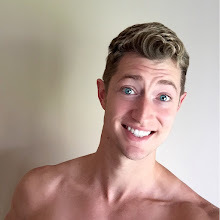 Hi blog! Because Stephanie showed a picture of her altar room's chair, here is my altar room's futon. That's like 2 chairs. Renee Olson of Sosanna's closet posted some pictures of her altar that feature her own beautiful artwork and statue! Two altars to Mama and Papa. Simple and fun! 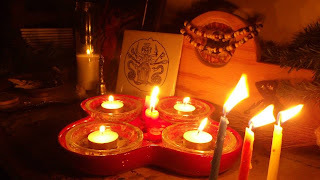 Susan shared 3 altar spaces with us. How Practical Magic witchy awesome is this?! Her matron and patron space.